Mr Swaffer had over 20 years’ flying experience as a private jet and helicopter pilot. His career included flying helicopters for live media broadcasting including Channel 4’s The Big Breakfast and the Virgin Radio traffic helicopter. Mr Swaffer’s friend Lucie Morris-Marr said he was a “veteran in the field” and would have done all he could to prevent lives being lost in the crash. She described him as a “funny and vivacious” man who was in an “aviation love story” with Ms Lechowicz. “Not many people get to work and travel with their soulmate, travelling the world going to glamorous places,” she said. In a statement, the Polish embassy said: “With great sadness, we received the news about the death of Izabela Lechowicz in the Leicester catastrophe. Prince William, who is president of the FA, said Mr Vichai made a big contribution to football, adding that Leicester City’s Premier League title-winning season “captured the imagination of the world”. “He will be missed by all fans of the sport and everyone lucky enough to have known him,” he said. Former England and Leicester striker Gary Lineker tweeted to say he was “deeply saddened” to hear of Mr Vichai’s death. Speaking outside the stadium, club ambassador Alan Birchenall said Leicester City owed “everything” to Mr Vichai. “We wouldn’t have won it [the Premier League] without him,” he said. “We wouldn’t have got near it without him. Thousands of supporters have shared an amended image of the club’s emblem with a crying fox on it on social media as a mark of respect. The club described Mr Vichai as “a man of kindness, of generosity and a man whose life was defined by the love he devoted to his family and those he so successfully led”. The team’s next fixture against Southampton in the EFL Cup, scheduled for Tuesday evening, has been postponed. Mr Vichai’s two horses, due to run at Leicester Racecourse on Monday, have been withdrawn. Jockeys there will wear black armbands at the meeting as a mark of respect. 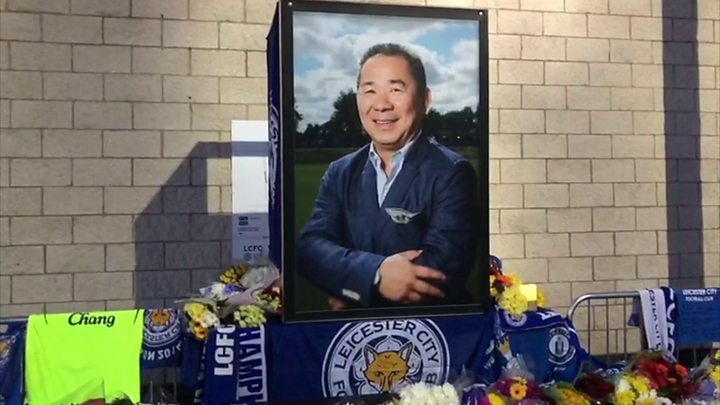 Leicester goalkeeper Kasper Schmeichel, who witnesses said ran out of the stadium towards the crash scene, said Mr Vichai had “changed football forever”. 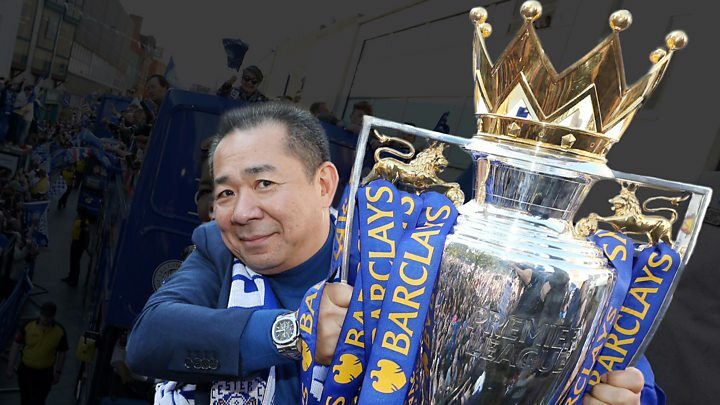 Premier League chief executive Richard Scudamore said: “Vichai was a gentleman who graced the game with his civility and charm and we will miss him enormously. Kasabian band member and Foxes fan Serge Pizzorno called Mr Vichai “an unbelievable human being”. “It never felt like he acquired this club to then sell on after a few years,” he said. “He bought into everything, bought into the city, supported everything around it. Who was Leicester’s billionaire owner? Supt Steve Potter said: “Emergency services were immediately on scene when the crash happened, working to put out the fire and gain access to the helicopter in attempts to reach those inside.